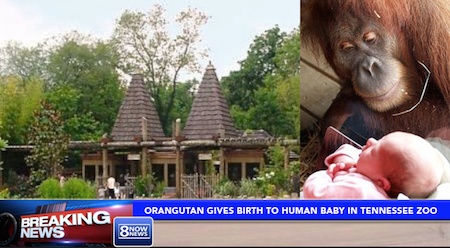 NASHVILLE, TN – Creationists have suffered what appears to be a final devastating blow to their theory of how mankind came to be, after Lucy, a 200 pound orangutan held in captivity at a Tennessee zoo, gave birth to a human baby girl this weekend. The birth is the final piece of the puzzle for evolutionists, who have long been waiting for a human to evolve from a monkey or gorilla. Many protestors are blaming this “strange birth” on DNA manipulation. Creationists are demanding a search of the premises by authorities claiming they believe “illegal tampering of human and animal DNA” is happening at the zoo. Authorities say they have not yet decided whether or not they are going to pursue any criminal charges or a formal investigation.